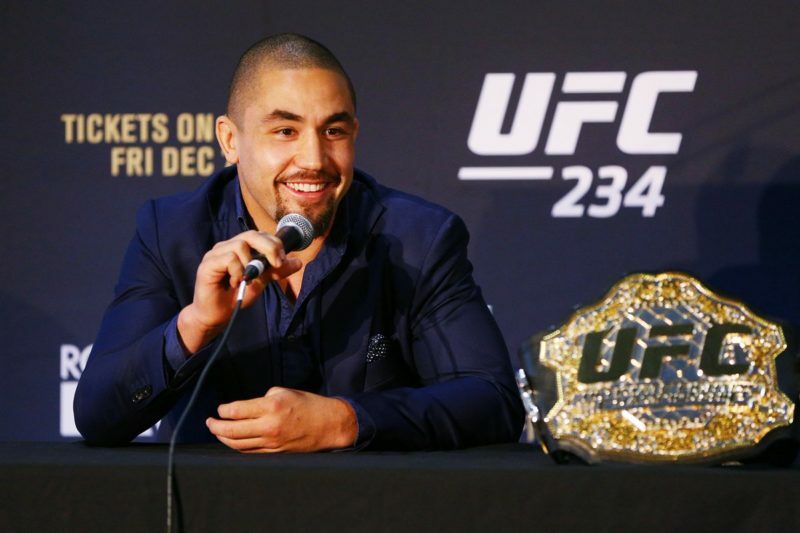 The Body Lock is here to provide you with live play-by-play updates and results from the UFC’s first event of the year. 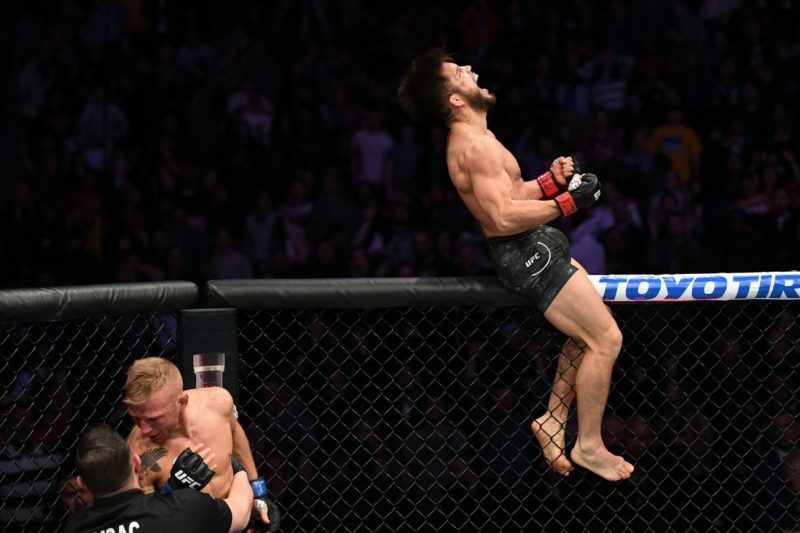 Debuting on ESPN, the event is titled UFC on ESPN+ 1 and will be headlined by a fascinating clash between flyweight champion Henry Cejudo and the current bantamweight champion, TJ Dillashaw. 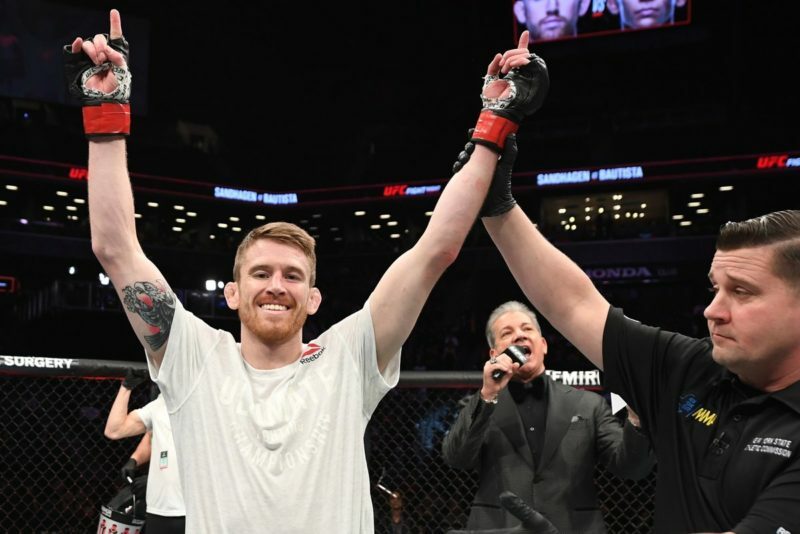 Follow along for our play-by-play commentary and live updates of the action at UFC on ESPN+ 1 in Brooklyn, New York. 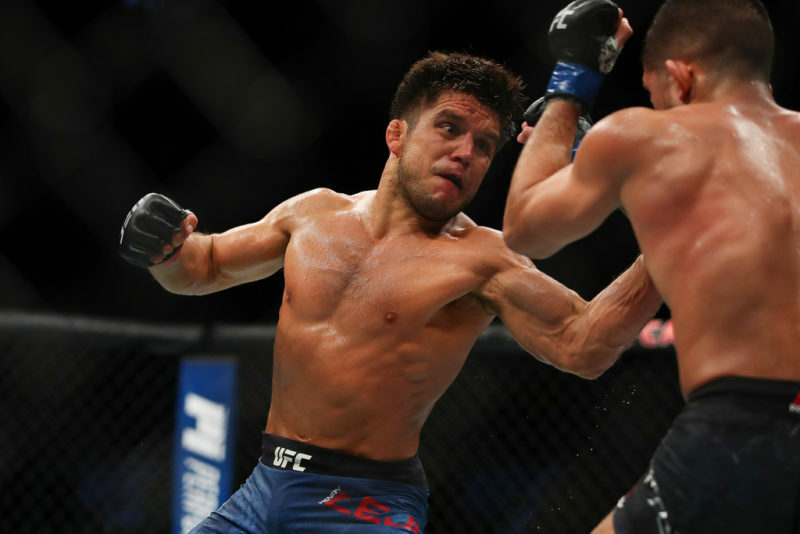 Round 1 – Cejudo takes the center of the cage and comes out aggressive. Cejudo throws up a high kick and it’s partially blocked but Dillashaw seemed unable to recover. 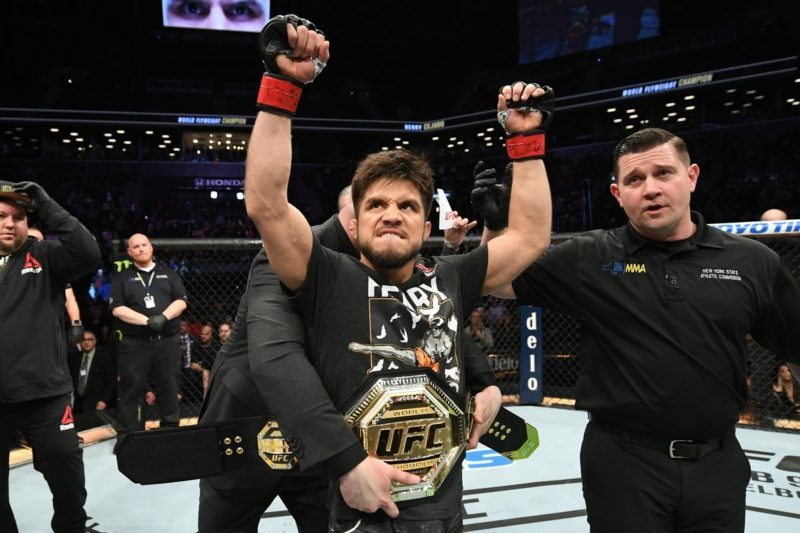 The flyweight champion kept on with an intense flurry of punches to the head and rocked Dillashaw some more. The referee steps in and it’s all over. Unbelievable. 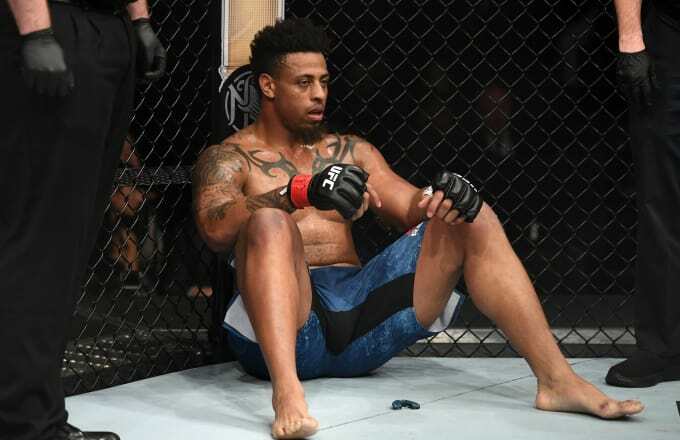 Round 1 – Greg Hardy takes the middle and connects with a heavy left hand early that drops Crowder to one knee. Crowder tracing around the edges of the Octagon and Hardy is all over him. Bomb after bomb. Crowder turns and clinches, pushes Hardy back into the cage. Hardy looks way too strong for Crowder, though, and turns him around with ease. Left hook lands for Hardy. Crowder grabs a leg and takes Hardy down to the mat. Time to find out what Hardy’s like off his back! Hardy has full guard and controlling the arm of Crowder, he can’t posture up. Hardy tries to stand and Crowder crushes him with a takedown and then moves into side control. Crowder looking for the crucifix and gets it. Hardy wall rides to try and escape. Crowder trying to maintain control and keep Hardy pinned to the mat. Hardy returns to his feet and Crowder looks for another takedown. Crowder has the guillotine choke and pulls guard to try and submit Hardy; it doesn’t work. Hardy’s now on top in full guard. Crowder working on isolating the arm of Hardy for a triangle or armbar but Hardy advances to side control and then front headlock. Round 2 – Hardy looks absolutely cooked before round two. Puffing and panting, he walks to the center of the cage. Crowder doesn’t have much to offer, either. We’ve got a fight on our hands. They’re throwing hard strikes, but not a lot of them. Crowder starts talking to Hardy and taunting him. Then he advances and attempts a takedown – Hardy sprawls and returns to this feet. Crowder’s on his knees and then Hardy connects with a knee to the grounded opponent. That’s not ideal. Hardy’s disqualfied. It’s all over. Round 1 – Medeiros staying tall and sticking to the outside. Gregor shoots in and hunts for a single-leg. Takes Medeiros to the mat and digs an inside hook. Rolls forward and takes Medeiros with him. Medeiros looking fine so far, Gillespie is staying heavy and wearing him down. Medeiros keeping his hands on the mat to remain ‘grounded’ and avoid taking knees to the head. Gillespie granby rolls and Medeiros finds an opportunity to escape, albeit only temporarily. Gillespie employing his typically smothering strategy, maintaining a body lock and continually dragging Medeiros down. The fans aren’t enjoying it, and the boos start to creep in. Anik mentions that Gillespie has racked up ten unofficial takedown attempts so far. Round 2 – Gillespie storms forward and cracks Medeiros with a hook. Shoots for a double-leg and pushes Medeiros all the way back to the cage. Incredibly suffocating wrestling on display by Gillespie so far. We’d estimate that Gillespie has maintained a body lock control for 60%+ of the fight so far. Lands in half guard now. Slides into full mount and lays heavy on Medeiros. Slicing elbows from the top now. A heavy strike forces Medeiros to turn and show his back. Gillespie crushing Medeiros with strikes now. Medeiros stands and Gillespie still has a hold of the grip around Medeiros’ waist. Drags him down to the mat and smothers him yet again. Medeiros turns his back completely now and Gillespie hammers him with more ground and pound to earn the TKO stoppage. 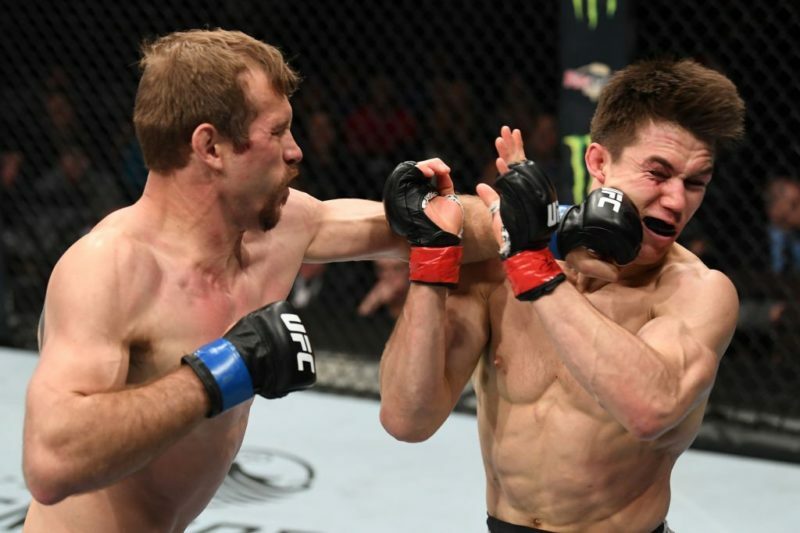 Round 1 – Dustin Ortiz active early; feinting and trying to slide into punching range. 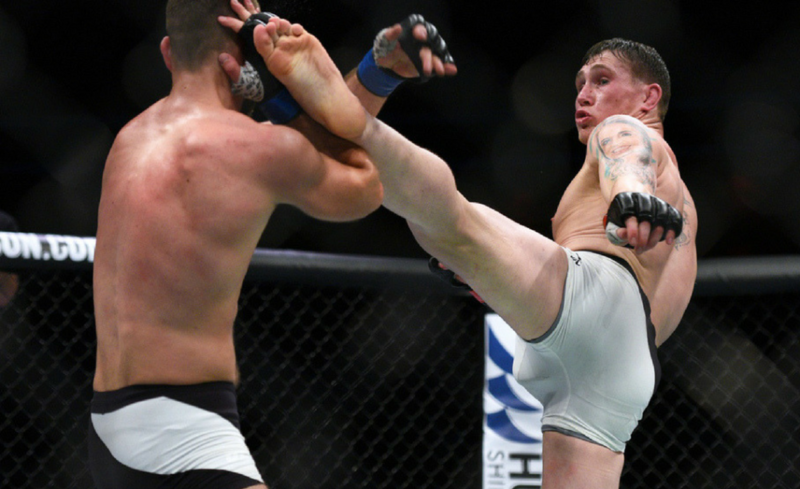 Benavidez lands one of his powerful leg kicks to off-balance Ortiz. Ortiz pressuring and Benavidez swings with a wild right hook but misses. Ortiz going after a takedown but Benavidez looks to lock up the neck. Drags Ortiz to the mat and maintains the front headlock position. Benavidez connects his hands and cranks on the guillotine but Ortiz survives. Benavidez controlling the grappling, working on takedown after takedown. They stand and Benavidez cracks Ortiz with a big left hand. Lands in Ortiz’s full guard. Ortiz looks to scramble but Benavidez staying heavy over the hips to maintain control. That’s the end of the first. Round 2 – Benavidez hunting for the takedown again early. Ortiz staying strong and defending it, then cracks Benavidez with a combo. Benavidez pushing Ortiz to the cage now, looking for another single-leg takedown. Ortiz locks his hands and stops the process. The two begin a scramble and Ortiz attempts to take the back. Benavidez turning in and attempts to gain half guard. Ortiz turns and then Benavidez drags him down to the mat, but then it’s Ortiz’s turn to escape and return to the feet. Benavidez lands a heavy hook as Ortiz moves forward. No one has the upper hand right now. Ortiz takes the back to end the round and attempts a rear-naked choke but Benavidez hangs on. Round 3 – Ortiz moves forward and Benavidez perfectly times a level change and locks up a double-leg takedown. Hands are gripped around the waist, but Ortiz eventually scrambles out of danger and secures a seatbelt grip. Now, Benavidez scrambles out of the position and ends up on top. Crazy. Constant changing. Neither fighter has held a dominant spot for a long period. Benavidez trying to take the back but both fighters are continually spinning and turning, changing position. It’s hard to know who’s getting the better of this contest. Is it a wrestling match? Or is it jiu-jitsu? This is super high-level grappling. That’s a wrap. Round 1 – Ostovich early clinch and takedown. VanZant scrambles but Ostovich into half guard. Ostovich holds head and arm control for about a minute before the referee stands them up for inactivity. Ostovich shoots and it’s the same scenario all over again. VanZant secures a lockdown from half guard and tries sweeping Ostovich but ends up in an uncomfortable position, wearing Ostovich’s weight. VanZant rolls for a leg lock and Ostovich attempts to escape. Both fighters are scrambling and rolling, Ostovich eventually clears her knee and escapes the danger. She then takes VanZant down and lands in mount almost immediately. Dominant first round, but not a lot of danger. Round 2 – VanZant looking for the high kick. Ostovich storms forward and secures the takedown again. Pressure passes from full guard to half guard and then tries to take the back. Slips off and then VanZant takes Ostovich’s back. VanZant doing damage. Wearing down Ostovich with strikes. Ostovich slides out the back and VanZant grabs her arm on the way to lock up the armbar finish. 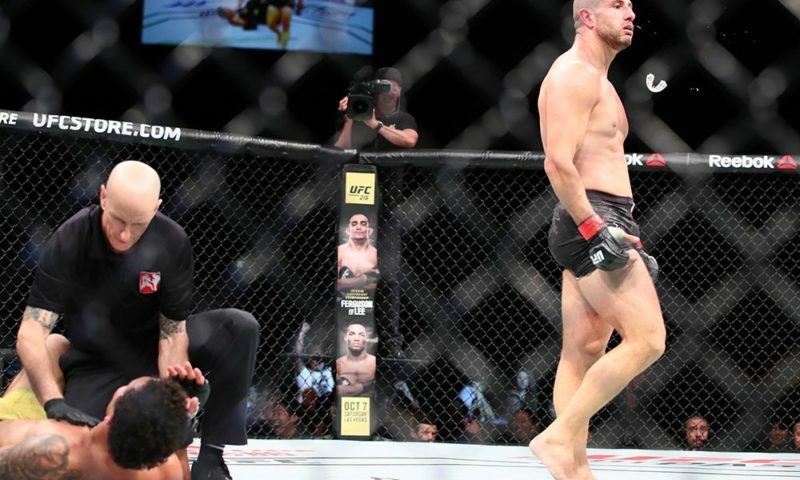 Round 1 – Glover Teixeira shot in for an early double-leg takedown but was unable to proceed with the attempt after running into the cage. Roberson used his upright position to unload a series of heavy Travis Browne-like elbows to the head of Teixeira. Teixeira dropped to the mat and looked done, but was able to recover not long after. He eventually worked to full mount before proceeding to lock up an arm-triangle choke. Roberson desperately recovered full guard and slid his arm out of danger. Glover kept up the pressure from top position before going after the arm-triangle for a second time. This time, he gets the tap. Round 1 – The crowd is ALIVE for this fight. “Cowboy” gets the cheers, Hernandez gets the jeers. Hernandez rushes out to the center of the cage. “Cowboy” trying to settle into the fight. Hernandez lands a clean uppercut but Cerrone takes it well. Cerrone shoots for a takedown and gets Hernandez to the mat. Hernandez explodes up. Hernandez walks Cerrone back to the cage and launches a series of knees to the body. Cerrone already slowing down, needs time to find his rhythm but Hernandez not allowing him to do so. Hernandez seems a little too fast for Cerrone through the first two minutes. Moving and shifting angles to land all kinds of punches. Every time Hernandez steps into punching range, Cerrone locks him up in the clinch but isn’t having much success there. Hernandez is busted up and bloodied. Intense pace and pressure so far. Cerrone storms forward with a 1-2, 1-2, 1-2 but doesn’t land cleanly. Cerrone finding his form; smashing Hernandez with a knee to the stomach every time Hernandez moves into range. “Cowboy” is looking sharp now. Crowd cheers as the round came to an end. Round 2 – Hernandez rushes out again. Muscles Cerrone back to the cage. Cerrone really settling into the fight now; looks sharp. Hernandez having trouble leaving the punching range of Cerrone, he’s moving backward and Cerrone follows him with straight punches. Cerrone crushes Hernandez’s body with a right kick. Fans are being treated to classic Donald Cerrone right now. “Cowboy” is utilizing all of his limbs, punishing Hernandez with knees, elbows, hands, and shins. Just as Hernandez had time to recover, Cerrone goes up high right a right high kick and flattens Hernandez. Finishes up with brutal ground and pound to score an impressive TKO win. Round 1 – Calderwood walks out and stands carelessly inside Lipski’s punching range. Lipski makes her pay with six or seven nasty punches to the head. Calderwood clinches and pushes Lipski back to the cage but Lipski turns her around and gains control of the clinch. They reset and Calderwood shoots for a double-leg. Successful takedown for Calderwood and she passes into half guard. Lipski attempting to control the arm of Calderwood to stop her from passing. Calderwood moves to the back and secures one hook. Locks up a rear-naked choke grip across the chin and begins to crank. Lipski turns and breaks the alignment to stop the submission attempt. Calderwood staying heavy on top now and controlling all aspects of the grappling. Calderwood attempts an arm-triangle submission but Lipski defends it by locking on to her own near leg and giving up her back. Jojo has two hooks now but Lipski remains calm. Calderwood transitions to an armbar attempt, but Lipski comes to her knees and begins to stack her. Lipski survived a submission onslaught in round one. 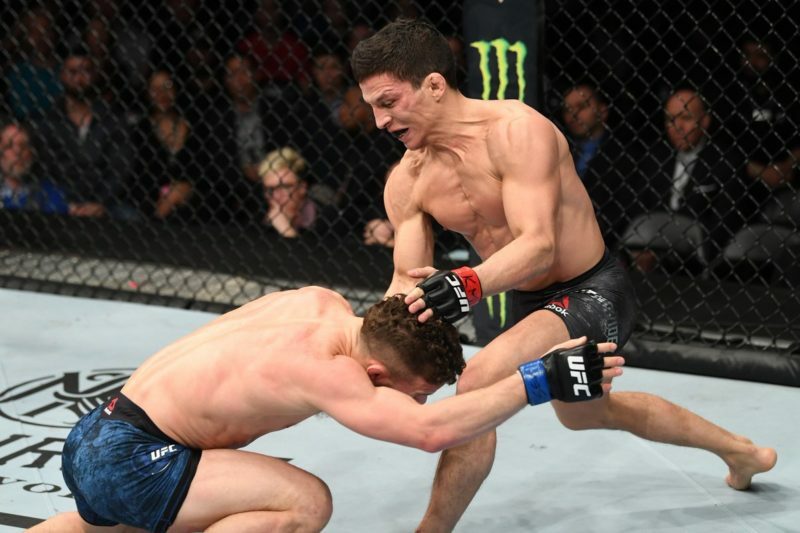 Round 2 – Lipski continually going to the body with a left roundhouse kick. Calderwood reaching with her strikes while Lipski is planting her feet and unloading on every attempt. Lipski bouncing, trying to loosen up. Calderwood sticking right in front of her. Joanne now getting the best of Lipski while standing, working her with straight punches. Lipski seems to be slowing. Calderwood goes high with a kick but Lipski defends. No head movement for Lipski, Calderwood landing cleanly with punches. Lipski happy to turn this into a muay thai style of fight, but Calderwood is outlanding her this round. Calderwood advances and pushes Lipski’s back to the cage. Round 3 – Calderwood feinting with kicks now. Lipski attempting to land power punches but seemingly no rotation through the hips; typical of a Muay Thai stance who wants to stay ready to launch kicks. Spinning back elbow for Calderwood almost connects. Lipski needs to mix it up, she’s not having much success in the stand-up. She moves forward into the clinch and trips Calderwood to the mat to land in side control. Calderwood gains full guard and is attacking from off her back. Calderwood going after the armbar but Lipski gets up to a combat stance and starts stacking Calderwood. Submission defense has been good enough tonight. Not much work from her when she gains an advantageous position, however. Calderwood back to full guard with less than a minute remaining. Experience and grappling dominance was the difference for Jojo tonight. Round 1 – Menifield storms out and drops Moreira with punches early. Attempts to follow up with ground and pound but Moreira scrambled for an armbar submission. Menifield comes back to the feet. Moreira looks like a giant out there compared to Menifield; taller, larger than his opponent. Menifield unloading with all of his strikes right now, maximum power every time. Moreira trying to deflect the incoming punches off his elbows with a high guard. Moreira clinches and moves to the cage. Menifield attempts a ninja choke while his back is against the cage. Both fighters reset in the middle. Moreira attempts a spinning back kick and Menifield slides in to land a couple of heavy punches and send his opponent crashing to the mat. Finishes up with ground and pound to secure the stoppage. Round 1 – Cory Sandhagen comes out aggressively and takes control of the center. He’s looking Dillashaw-like early, mixing in strikes to the head and body seamlessly. Bautista is in the fight, answering back by catching the leg of Sandhagen and countering with strikes. Sandhagen looks slick, though, landing cleanly. Sandhagen drops Bautista with a flying knee. Attempts to get the finish but Bautista survives. Bautista picks up Sandhagen and slams him but lands in a triangle submission attempt. Survives that, as well. Sandhagen now rolls to an armbar attempt and turns belly-down to get the tap. Incredibly entertaining performance by Cory Sandhagen. Round 1 – Bermudez advances immediately. He begins working the legs of Edwards with kicks. Edwards shifts forward and cuts an angle to attempt a lead right uppercut. Even throws in a fake knee-tap takedown before coming upstairs with a punch. 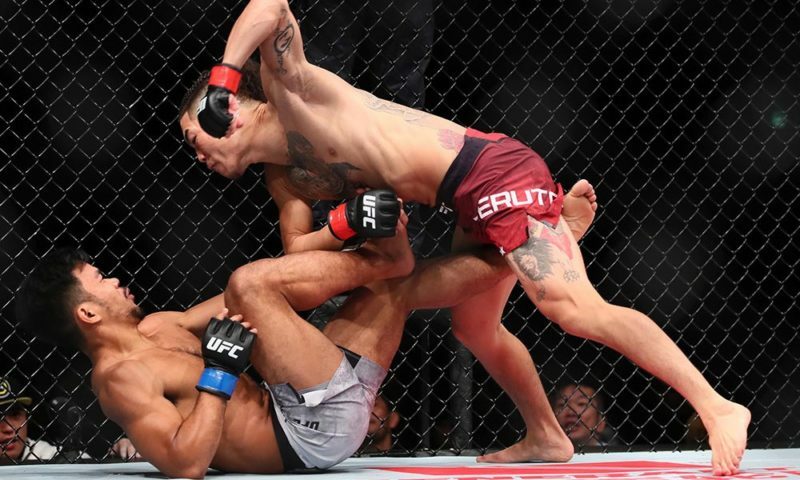 Bermudez pushes him to the cage and attempts to slow the fight down. Edwards lands a strike and seemingly hurts Burmudez, but he is back to his feet almost right away. Bermudez’s neck is exposed on every takedown attempt and Edwards is playing with the idea of wrapping it up. Bermudez attempts another single-leg takedown and Edwards stuffs it and stays heavy. They return to the feet and Bermudez launches a combination of strikes. Dives on another single-leg attempt. The pace and pressure take a toll, as he eventually overwhelms Edwards and gets him to the mat. Throws down heavy elbows to end the round. Round 2 – Dennis Bermudez begins with a single-leg attempt and Edwards goes for the guillotine this time. He loses it and ends up in half guard. Bermudez passes and begins working on the arm of Edwards, looking for a kimura. Switches up to a guillotine attempt as Edwards attempts to stand. Edwards slowly works back to his feet and they reset in the center. Bermudez grabs the lead leg and drags Edwards to the mat again. Lands in half guard and begins working him with ground and pound. Finishes the round on top. Round 3 – Bermudez is taking over. Edwards seemingly giving up. Bermudez’s single-leg attempts are coming much easier now in round three. Edwards falls to the mat and gives up position. Bermudez moves into mount with a guillotine attempt before rolling to his back. No control of the body; opts to remain heavy in the front headlock position now instead. Lands in half guard and softens Edwards up with some strikes before eventually sliding into full mount. Edwards not controlling the posture and he is essentially allowing Bermudez to rain down strikes. High mount now for Bermudez and he waits for Edwards to roll into an armbar submission. Goes belly-down but can’t extend the arm. Loses the spot. 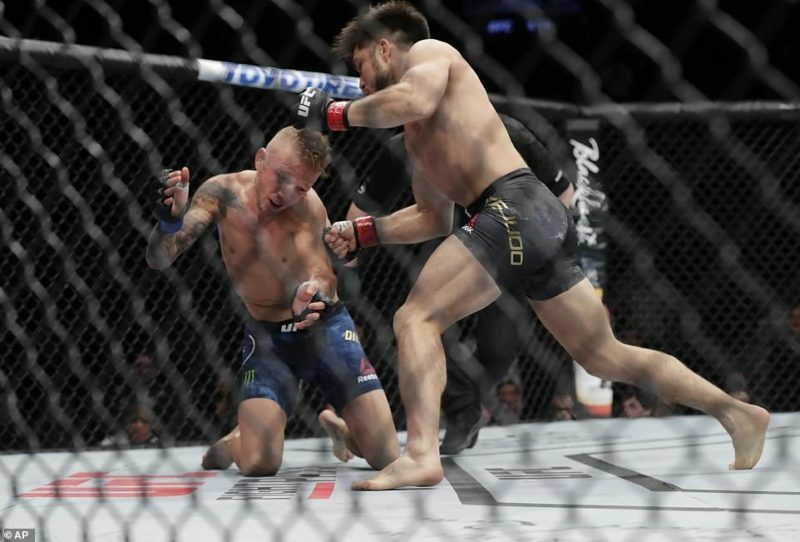 Edwards is fatigued; attempts to bait Bermudez into a striking contest but Bermudez level changes and lands in half guard. Edwards escapes with seconds remaining and explodes with a couple of heavy strikes. As they say, it’s too little too late. Round 1 – Slow, patient start from both fighters. Neal advances with a left roundhouse kick to the body and straight punches to close the distance and enter the clinch. Muhammad grabs an overhook and escapes. Leg kick inside for Neal. Then goes outside with the kick. Muhammad moves forward with a combination of punches, none land cleanly. Neal throwing out the jab. Belal shoots underneath and penetrates with a double leg takedown; seems like a decent takedown attempt. Neal defends and escapes. Resets in the middle of the cage and begins walking Muhammad down again. Neal the more active, efficient, and effective fighter through the first round. Round 2 – Neal walks Muhammad back to the cage and begins smoking him with heavy punches to the head. Muhammad looks outmatched already. Neal connects with another heavy left hand. Muhammad single-leg takedown attempt, turns the corner and lifts; Neal somehow manages to escape again. Too athletic, too strong for Muhammad so far. Like a long-lost bushwalker who has found a glimpse of light – a chance of survival – Muhammad has found success by targeting the body of Neal. He pounds a left uppercut into the body. Neal defends yet another takedown attempt against the cage. Takedown defense has been superb so far. Muhammad’s face is busted up now; bloodied and bruised on the left side. Neal’s boxing making the difference yet again. Muhammad shoots again but Neal pivots and cracks him with several devastating punches to the head. Another solid round for Neal. Round 3 – Muhammad starts the round with another takedown attempt. Nothing has changed in-between rounds, however, as Neal sprawls him into the mat. Neal lands several big strikes. A heavy head kick lands for Geoff Neal and he drops Belal Muhammad. Somehow, Muhammad is still functioning and returns to his feet to exchange strikes and move Neal backward. Insane. Muhammad’s exhausted now; loses his balance and falls over. Both fighters still throwing hands. It’s Muhammad advancing at the end of the round, believe it or not. That’s a wrap.